Before heading on my vacation to New Orleans (which was absolutely fantastic by the way), I saw that Bob Balch (of Fu Manchu fame) posting a pedal board of the stars post on his awesome site – PlayThisRiff.com. The video, actually a two parter, was for Tim Sult of Clutch. I thought it would be cool to post this updated pedal board on EffectsBay.com. I sent Bob a email and he was glad to share! Over the years, Tim has changed his board, but the core options/functions remain the same, various brands and models appear. Right now I’m thinking of shots of Dunlop Wahs to Teese Wahs, etc. 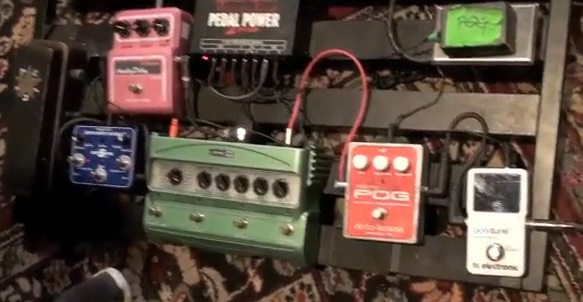 The photo below is the latest image of 2011 of his board. The interview of Tim Sult by Bob Balch was a good watch for sure. To view the video, you do need to be a member of PlayThisRiff.com, and if you’re interested in learning about riffage of some of the heavier bands out there, then you need to be a member of PTR.. no question.